With its monkeys, clowns, and good bananas duking it out against bad ones for banana supremacy, the new campaign for the iconic fruit distributor tries to bring out the kid in everyone. Everyone, at some point in their life, has peeled off a Chiquita banana sticker and stuck it inside a notebook, or onto the back of a driver’s license, or on a best friend’s forehead. 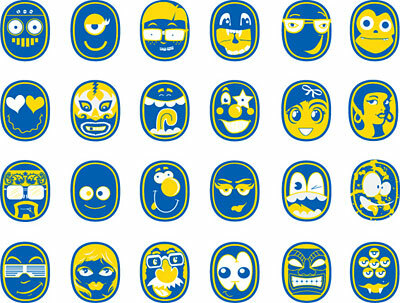 This idea was the starting point for Neff Ink’s new campaign for Chiquita, which creates a family of new stickers depicting playful characters, from monkeys to clowns to Mexican wrestlers (my personal favorite), all rendered in Chiquita’s familiar, iconic color palette of blue, yellow, and white. With more stickers getting peeled and stuck, more bananas will be getting peeled and eaten, which is obviously good news for Chiquita, but since bananas, which are high in potassium, stimulate brain activity, it’s also good news for everyone doing the eating. Perhaps that explains why this campaign is so clever, since, as art director DJ Neff related in a recent interview, he and partner Mark Krajan ate a ton of bananas for inspiration as they worked on the project. I could use a little brain-activity stimulation to get to the end of this post, but unfortunately for me the only banana in my fruit bowl (Dole, incidentally) is very brown and quite soft. 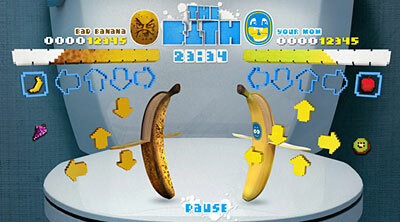 Which leads me to another inspired element of Neff’s brand refresh: Building on the idea of bananas with personalities, they developed the tag line, “Don’t Let Another Good Banana Go Bad,” and let it guide other elements of the campaign, including viral videos and the Eat a Chiquita Web site, which center around a perky, cheerful good banana and a resentful, past-his-prime bad banana. The campaign offers a nice example of the way that a brand’s existing equity can be harnessed to create new value–it’s attention-grabbing while still providing a clear visual and tonal connection to the brand identity we already know. It’s easy to imagine kids loving this campaign–I know I do, and it has a good shot at keeping Chiquita from becoming second banana to any other brand for years to come.